I rarely write about the UK economy, because I fear delusion and confirmation bias. (Economists suffer badly from confirmation bias.) Nevertheless, there is one thing that needs to be understood by anyone who claims to know what the future holds for the UK. It is this: regional inequalities in income and wealth within the UK, and most particularly within England, are worse than at any time for which I have the data. For decades, these inequalities have been widening and widening without significant political consequence. They may finally have become so wide that they constrain all sorts of policy-choices (for example, I suspect the Brexit vote is one consequence). There are a couple of economists who begin to be concerned - Jim O’Neill is one, and Bank of England’s Andy Haldane are both on the roll of honour. But I expect that the London-based financial services industry have neither the knowledge nor interest to prevent themselves from being repeatedly blindsided by the policy implications. This is short-sighted, because without acknowledging the deep economic foundations of political dissatisfaction, analysts are unlikely to understand its durability or its longer-term consequences. The assumption that the political settlement which has produced this inequality can continue unchallenged must, surely, be naive. The available data is unambiguous and damning. It is easiest to demonstrate by using the gap between London and elsewhere in the UK as the benchmark. The ONS has been producing extremely fine-grained survey data on household income by region and city since 1997. 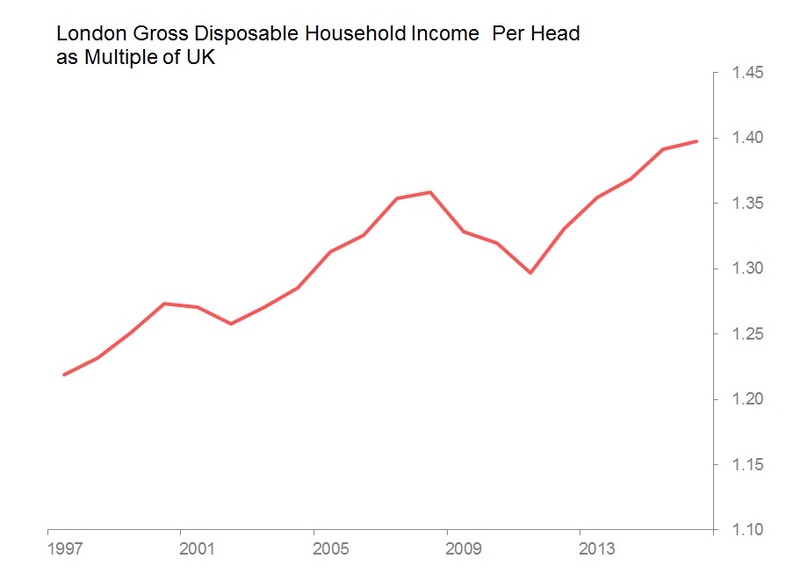 Back in 1997, the average London disposable per capita household income came to £13,183, compared to a UK average of £10,817 - a multiple of 1.22x. By 2018, London’s average had risen 106% to £27,151, whilst the UK’s average had risen only 80% to £19,432 - the multiple had risen to 1.40. There’s no reason to believe the multiple isn’t even higher today. But this is not just a story about London’s success, it is also, alas, a story about failure elsewhere. In the North East, the rise in per capita income since 1997 is just 68%, and its 2016 £15,595 average is below anything London has had to get by on any time this century! (London’s income is 1.74x that of the North East). The regional income inequalities continue to worsen. There are two ways one can illustrate this. First, one can express the standard deviation of regional disposable income as a percentage of the mean: the higher the number, the greater the relative dispersal of regional income. In 1997 the standard deviation of incomes was 13.7% of the mean: by 2016 it had risen to 18.6%. Second, by comparing the median to the mean, one can capture the degree to which the sample is skewed at the upper end. The same story emerges: back in 1997 the mean reading of per capita disposable income was 106% of the median - a level which it maintained with little change until around 2004. Peak-finance prior to the crash lifted the mean to around 108% of the median, where again it stayed, with wobbles, until around 2012. However, since then the ratio has taken off once again, and by 2016 it stood at 109%. In short, the regional dispersal of household income is increasingly skewed towards the richest regions. When it comes to wealth, the story is of course similar. The most obvious evidence comes from the property market, and in particular the way in which London house prices diverged from the rest of the UK in the aftermath of the GFC, and in particular after the introduction of quantitative easing by Bank of England in 1999. Between 2007 and 2016, average UK house prices (ie, including London houses) rose 13.9%, whilst during the same period London house prices rose 58.5% (the data comes from the ONS house price index series). At the beginning of 2007, the average London house price was 1.5x that of the national average: by end-2016 the multiple had risen to 2.2x. Since the national average price includes London itself, the expansion of the London multiple is unrealistically muted. Consider, then, the divergent course between prices in London and in Yorkshire (where I live). In the period that London’s prices rose 58.5%, Yorkshire’s prices rose. . . 1.6%. The London/Yorkshire multiple rose from 1.9x to about 3.2x. Or, to look at it from a Yorkshire point of view, when the City helped blow up the world financial system, quantitative easing gave Londoners a free house. Still, the current fall in London house prices provides the first suggestion that the epic divergence is discovering its limits. Issues of inequality are easier to lament than either to diagnose or correct. Measures of disposable income and property wealth are neither complete or sufficient indicators of regional disparities. This piece could be extended to cover regional disparities of public spending on education, health and infrastructure (transport!). Conversely, it would also be possible to mount a rearguard defence of the widening inequalities as merely the result of a free market. For now, though, the point is simpler: underlying every society is an assumption that it is coherent. In statistical terms, we can say that the distribution of resources and outcomes represent a coherent, usually Zipfian, sample. When inequalities become sufficiently great, they threaten to disrupt the coherence of the sample. If you don’t expect the disintegration of the UK, then you should expect policies designed - successfully or not - to close the regional inequalities which have opened up since the financial crisis. Newer PostUK Regional Inequality: Is the UK Still a Coherent Sample?